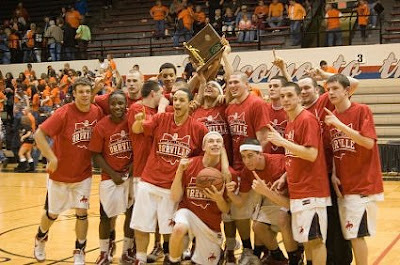 Orrville Red Rider Sports Blog: Season of Dreams...headed to Columbus!!! My goodness!! This just keeps getting better and better...and more unbelievable. Orrvillle goes back to state after a 67-56 win over Newton Falls. The magical season will continue at Value City Arena (can't believe I'm actually writing this sentence) on Thursday (2pm) against the Silver Knights of Columbus Bishop Ready. Let's all bask in the glow. Thanks to Mike Guster for the pic. Here's a rundown of all the local media coverage. Youngstown Vindicator, Warren Tribune, Wooster Daily Record, Ohio.com (pictures), Rod Dilyard Photos. Kind of ho-hum. We were clearly the more athletic team and had so much more size than them. When their shots weren't falling and we were able to push the tempo, it was obvious that we had what we needed to win the game. Tip of the hat to Max Pirman. Only had 5 points, but locked down Falls' leading scorer Brian Sole to the tune of ZERO points in the first half and only 9 for the game. Also to Zach Wasson. His first 3 tourney games were not his best, but 47 points and dominating efforts in his last 2 games shows why he will garner an All-Ohio recognition later this week. What else can you say about Jacob Bolyard? Such a special talent. Now over 500 points for the season, something only 5 other Red Riders have ever done. Sam Miller can jump very high...anyone else notice this? Obviously, I'm being a little sarcastic....but from my catbird seat last night (thanks to Orrviews), I was blown away at his jumping ability. His hustle leads to extra possessions for us, and that can't be underestimated. Great win for Coach Sly. Notched his 20th win, and now adds a regional title on top of the district title won only last week (seems longer than that, no?). So encouraged by the product he puts out on the floor. Everyone plays tough and that's a reflection on him. Imagine for a moment that the Riders win 2 more games and capture a state title. Maybe the greatest rookie season for a head coach ever? Considering where the program was, and now is, his effort and determination have been so refreshing. Again, not to reflect too much...but has any other team in the final four (all divisions) had the kind of one-season turnaround that we have? From getting bounced in the first round to making the final four in a year's time.....very impressive. $15 each for Entry and Club Levels & $12 each for Terrace Level plus applicable service charges. $8 pre-sale tickets are available at participating schools. The Daily Record listed tickets as being $12 and $15....but the $8 presale number is a little more palatable. Nice to see you court-side Tim. Great game! So proud of these kids. Can't believe we're heading to Columbus again. What a wonderful experience for these boys. So great to see all of their hard-work & dedication pay off. They are a tremendous bunch of athletes led by a very special coach.